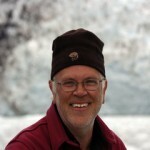 Neptune, Peter’s father, is the driving force behind Pacific NW Expeditions. He and Peter used to dream of one day sailing around the world together, and he gave Peter the wild hair for sailing (maybe it was the seagull-and-sailboat wallpaper he chose for Peter’s childhood bedroom). For the record, it was Neptune’s idea that he and Peter get tattoos the first time they sailed to the top of the Inside Passage. And good thing, too, because they will never forget what an awesome achievement that was. Neptune is a hardy and adventurous spirit. The first time he sailed to Alaska it was without a dodger or a wood stove! Today Mike Frost serves as First Officer aboard the ship-of-war Privateer. He is a Gulf of Alaska veteran and Peter has managed to pull him out of the office long enough to log over 10,000 nautical miles on the Inside Passage. They look forward to many more days on the water, and never lose sight of what the most important things in life are all about! 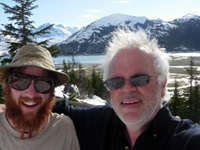 Peter and Neptune gone full-native in Alaska, day 90!